Space. If you live in an apartment, it can be difficult to find enough space for a dryer. The best cloth dryers for home or apartment use are both affordable and compact. Read on for a list of products that you can buy for your personal use. 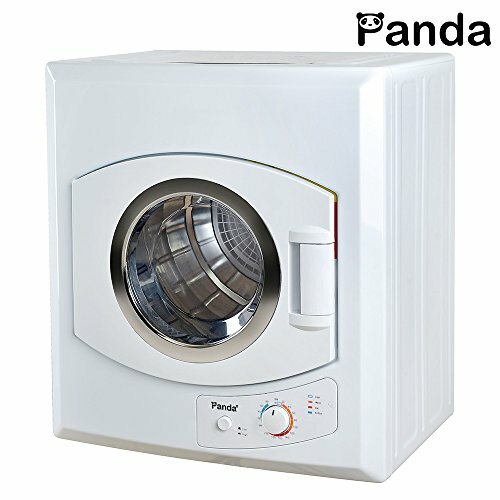 This Panda compact dryer isn’t fancy. It may not be as good as the dryer at the Laundromat, but it’s better than air drying clothes for hours or days. The price. Forget the dryers that cost thousands of dollars, you can buy this for less than $500. The features aren’t bad either. This dryer has a capacity of 2.65 cu.ft., which means it can hold around 8 pounds of wet clothes. That translates to about two medium size loads you can put in the dyer directly out of the washer. You can select between 4 heat options. This dryer is 110V. That may seem like a low power gadget, but this dryer may need to work longer to dry clothes compared to the standard 220V machine. The inside of the dryer has a stainless steel tab that won’t corrode with continuous use. The mounting bracket for walls is provided. It’s lightweight and compact. It can easily fit inside apartments, condos, or even dorm rooms if needed. The machine has a removable lint filter included. When in use, it will blow out warm air. This can really be problematic in the summer. The dryer will increase humidity levels in a room. To prevent this, you will need to include a venting hose. It’s not included in the package, so users will have to separately purchase a venting kit. The machine periodically tumble dries clothes just like dryers in commercial Laundromats. The tumble drying function prevents wrinkling of different types of fabrics. It has two drying temperatures to suit different types of fabrics and loads. The machine can hold up to 5.5 pounds of wet clothes. 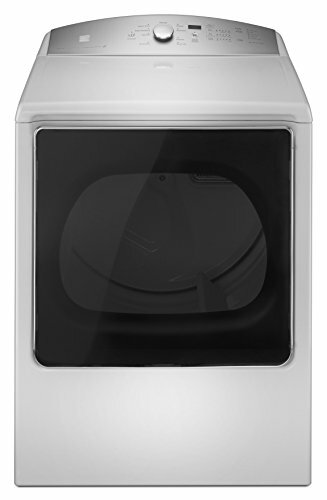 This dryer has a see-through window, like in a washing machine. It’s easy to monitor clothes when the machine is in operation. If there’s a problem, the user can quickly turn the machine off before things go wrong. The tub of the dryer is made from stainless steel. Overall, this dryer is really compact and space-saving. The dryer is small enough to be wall mounted or placed on a countertop. This dryer doesn’t require complicated assembly. It’s easy to install without needing any kind of special wiring. As for downsides, this dryer only has a capacity of 1.5 cu. ft. That’s not much when you have more than two loads of laundry in the washer. Another problem is the 110V power source. It’s a low-power product, which means the machine would need to work for a long time to get your clothes dry as desired. MC Appliance Corporation - Misc. This is not a conventional dryer with a drum. This is an innovative hanger-dryer that you can place in an apartment right next to your closet. Clothes are hung on poles with hangers, just like you would in the closet. Then, zip up the covering and turn on the machine. It works by controlling the airflow from the bottom with a fan-like apparatus. This dryer doesn’t need any special hangers as you can use your own. You can dry just about any type of fabric using this. There’s no fear of shrinking, wrinkling, stretching, ripping, or any type of damage as with tumble dryers. It takes a long time to dry clothes. Even small and thin items like underwear and scarves can take about 40 minutes to dry fully. This dryer may not be suitable for larger types of laundry. It’s possible to dry small sheets, but not comforters or king-sized linen sheets. The machine has a motor inside. Fortunately, it works quietly. You can plug this into a regular wall outlet. There’s no need for additional venting. This dryer is amazingly portable. You can move it around as desired. Not to mention, this dyer is supremely affordable. You can own one for less than $100. This dryer comes unassembled and it may take a while to put together. It is backed by a 2-year warranty. This dryer is expensive, costing over $500. But it is the closest you can get to a commercial tumble dryer that you can keep at home. This dryer is powered by a tech called SmartDry Ultra. It can fine-tune temperature levels to best match how wet the clothes are. The result is optimal drying times without damaging fabrics. This dryer is more gentle on clothes than most commercial machines. This dryer is NSF Certified for sanitizing. It can kill nearly all germs and bacteria on clothes even after washing. This dryer is quite large. It’s not suited for compact living spaces. It requires suitable vending. The machine delivery also includes hookup, so buyers don’t have to worry about setting up ventilation. Of course, if the delivery to your area doesn’t come with the installation service, you will have to hook this up on your own. The process can be complicated. This dryer requires a 240V outlet. It’s quite powerful as a result and works fast. Drying has a wrinkle guard function to protect clothes. It can dry clothes as fast as under 30 minutes with the Express Guard function. This machine is everything that the standard clothes dryers are not. 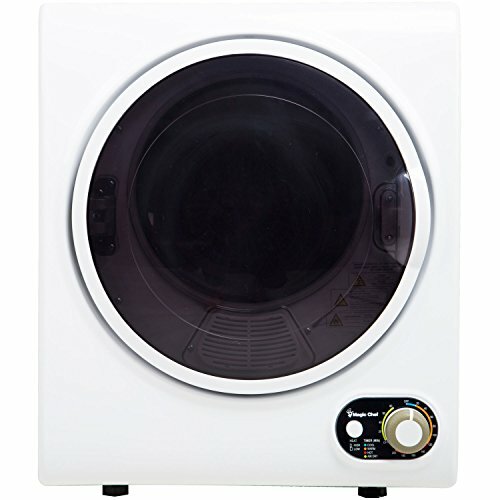 If you don’t want a heavy and expensive dryer that may damage fabrics, then this is the best alternative to own. This is an electric dryer. But instead of tumble drying clothes, it spin dries. It has a motion similar to the spinning function found in commercial washing machines. However, this spinner has a speed of up to 1,800 RPM. So it’s quite powerful enough to actually dry clothes, unlike washing machines. The brand claims laundry can be dried under 3 minutes 90 percent of the time. But take that claim with a grain of salt. Not all fabric types will dry with spinning. Some synthetic fabrics like polyester can dry quickly after a spinning function. It won’t work the same with fabrics like cotton. For cotton and similar fabrics, the clothes will just get thoroughly wrung, not dry. You may have to air dry the rest. This machine is quite tall and has a capacity of 12 pounds. It can accommodate full loads. The spin dry function can really stretch clothes. Care must be taken with delicate fabrics. The machine may also leak. If you keep it in a room, make sure to place a bucket or a plastic tarp underneath to protect the flooring. The Laundry Alternative (Large appliances) - Misc. Tumble dryers use heat to dry clothes. These types of dryers are common in commercial Laundromats and homes as well. Tumble dryers can get even the thickest of fabrics dry in less than an hour. These machines may have different heat settings for different types of fabrics. These dryers are not without problems. The tumbling function can damage some fabrics. It’s easy to shrink or severely wrinkle clothes. These dryers can also be really expensive. Even a compact tumble dryer can cost upwards of $500. Spin dryers have tubs that spin really fast to wick moisture off clothes and get them dry. Spin dryers are inbuilt into washing machines. Separate spin dryers may work a bit more powerfully than the spinning function found in washing machines. The separate spin dryers often have high RPM powers to get even cotton clothes dry fast. Because spin dryers don’t apply heat, not all fabrics may dry completely. Some air drying may be required following the spinning. Portable dryers are unconventional gadgets powered by electricity. Unlike spin or tumble dryers, these don’t have a drum at all. These dryers are highly portable. You can move them between rooms or even keep them next to the closet. 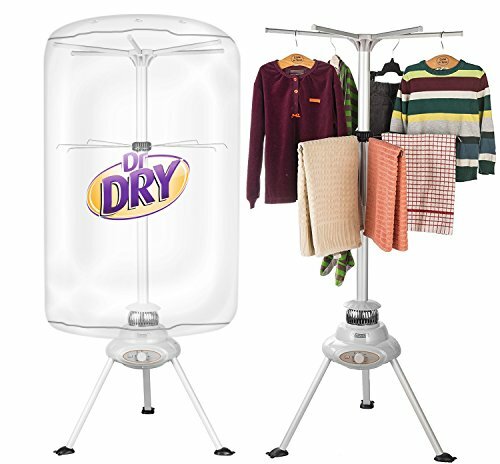 Portable dryers have long poles with arms to hang clothes like in a closet. Then the whole thing is covered for drying clothes. Portable dryers often have a fan at the bottom. These blast air throughout the enclosure to dry clothes. These dryers are highly advantageous because they don’t damage clothes through heat or spinning. So they are quite great to use for delicate fabrics. The inevitable downside is that portable dryers take a long time to work. You may not be able to hang certain types of laundry like big sheets or curtains. Capacity may be provided in cubic feet or in terms of weight. For a full load, you may require about 10 pounds of capacity in the dryer. This is an important feature to look for in a dryer because it indicates how efficient or large the dryer is. A small capacity dryer may get clothes dry, but it will have to work a long time to finish the whole load. Some dryers blow out hot air and moisture when working. That can increase humidity levels in rooms. Therefore, some dryers require installing a vent system. The brand may include ventilation during installation. Otherwise, you will have to buy a DIY ventilation hose to keep rooms bearable in the summer when the dryer works. There are dryers that don’t require any type of ventilation, such as portable hanger dryers. What type of voltage does the power outlet of the dryer require? You will have to carefully pay attention to the number. The higher the voltage, the more power the machine will require. The standard dryer will require a 220V power outlet. If the required voltage is higher than 220, you may need to install a special wall outlet or require special wiring in your home to safely use the dryer. Pay attention to the dimensions of the dryer. It will determine where you can place the machine. Compact dryers are wall mountable. But some types of dryers need to be placed on the floor. If you live in an apartment or an RV with limited space, size will matter a lot. Make sure the dryer doesn’t require special wiring or specialized installation before purchasing. The seller must provide installation if it’s the case. Some dryers may leak out moisture. If you are placing the machine in a carpeted room, it’s important to protect the flooring with adequate protection. A warranty for a machine is highly recommended because parts can be very expensive to replace. Cheap, budget dryers may not completely dry clothes like commercial machines. Therefore, purchase one knowing all the limitations. When installing a new dryer, it’s best to consult an electrician regarding how it might affect your home or apartment grid. Clothes dryers can be expensive. However, there are residential models that will suit your budget and storage needs. 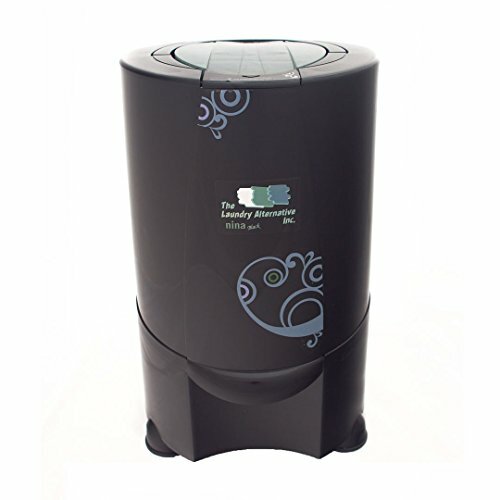 Alternative dryers are highly affordable and suited for small living spaces. In any case, you should buy a dryer only after taking all the features into consideration. Read the buyer’s guide above to educate yourself on all the necessary features. Once you are familiar with the nitty-gritty, it will be easier to buy the product that best suits your needs.